Tim Burton is a great filmmaker, and it’s ironic that the film people most often associate with him is one he didn’t actually direct. It’s a stop-motion-animated love/horror/Christmas story musical that has become a cult classic, and it’s one of my favorite films. Prior DVD releases have been good, but suffered from sub-par video quality. Now, for the film’s 15th anniversary, we get the film on Blu-Ray! Is this the hi-def event fans have been waiting for? 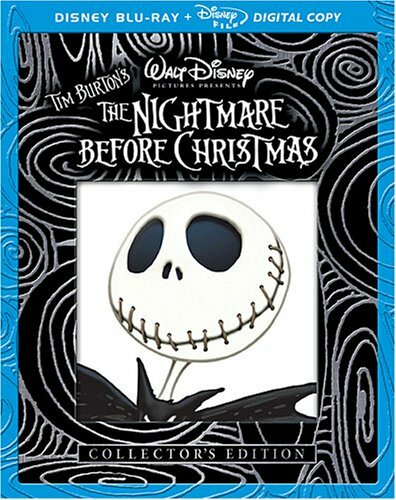 Find out in my review of Tim Burton’s The Nightmare Before Christmas: Blu-Ray Collector’s Edition. Tim Burton’s The Nightmare Before Christmas operates and succeeds on an amazing number of levels. As a piece of art, it is an unbelievable achievement. The stop-motion animation is flawless, and Burton’s art style is on full display here, giving the film a unique goth look that no film has ever replicated. But the film is also a musical, and Danny Elfman’s score is something Beethoven might be proud of. It’s a love story, and a touching one at that. It has humor. It has drama. It has a poignant message about finding yourself, and even has a spirit-of-Christmas vibe. And all of this is contained in a fantasy world that, through the brilliant design and the multi-dimensional characters, feels completely real. Nightmare Before Christmas is a monumental achievement, and a classic for the ages. For those who don’t know, it tells the story of Jack Skellington, also known as The Pumpkin King. He lives in Halloween Town, where the citizens only care about putting on a good Halloween. But Jack is beginning to feel bored of Halloween, and ventures out into the forest one night only to find the door to Christmas Town. He becomes enthralled with Christmas, and decides to have Halloween Town put on their own Christmas. Much has been said about this film, and there’s not much I can add. My favorite element of the movie is Danny Elfman’s music; in a career filled with great music, this stands head and shoulders above the rest of his work. Nearly every second of the film has music, and the songs are worthy of being in a Sondheim Musical. But the animation is also unforgettable; stop-motion is one of my favorite art forms, and Nightmare is possibly the best example. The sets are rich with detail, and the animators created a fully-realized universe for the characters to inhabit. But animation alone doesn’t make a movie great; in the end, it’s the engaging characters and the touching love story that make the film so good. It’s deranged, off-beat, and altogether perfect. Put simply, if you haven’t seen Nightmare on Blu-Ray, you haven’t seen it at all. The first shots of the forest were stunning, but it was when we arrived in Halloween Town that my jaw literally dropped. There really was no way of knowing how intricate a world the animators created when they built all these miniature sets; the amount of detail on every bit of scenery is simply mind-blowing, and Blu-Ray shows it all in its full glory. Colors simply explode off the screen; they are vivid, sharp and accurate. There are colors on display here that I’ve never noticed before; for instance, Sally has a blue tint on her face that wasn’t noticeable on DVD. Contrast is perfect throughout, with blacks as deep and dark as night. But the detail is what will really blow your mind; you can see every tiny bit of detail on every character, set, etc. You can count the grains of dirt in Halloween Town, and the flecks of snow in Christmas town. Every bit of dirt or grime on the walls is visible. There is so much to discover in this image that I suspect it will take many viewings before I even begin to take it all in. It’s impossible to realize how complete and detailed a world the animators created unless you see the film on Blu-Ray. The audio is equally impressive. When “This is Halloween” begins to play, you can clearly hear every instrument; like in the image, there are things to discover in the audio. In “What’s This?” I heard a faint drum part that I swear is inaudible even on the CD. Dialogue and singing voices have a crispness that makes you feel the voice actors are sitting in the room with you. The audio is incredibly descriptive, and with the film relying so heavily on music, this is essential. You’ve never heard Elfman’s score sound this incredible. Overall, the experience of watching the film on Blu-Ray amounts to sensory overload. My eyes were darting all over the screen trying to take in all the detail, and my ears were listening to and picking apart the deep and descriptive audio. This is a reference quality disc; if you want to convince someone of what Hi-Def can do, show them the “What’s This?” song number in Christmas town. The previous DVD incarnation of the film had a great selection of Bonus Features that would appear hard to top. For this Blu-Ray release, Disney has thrown in everything, the kitchen sink, and then some. The first feature you’ll see is the Blu-Ray Exclusive Tim Burton Introduction, where he introduces the movie and talks about how amazed he was to see it on Blu-Ray; superfluous, but cool nonetheless. Going down the list from the Bonus Features menu, things start off with What’s This? Jack’s Haunted Mansion Holiday Tour. This is split into two videos; the first, On-Track (7:14) is a walk-through tour of the Haunted Mansion at Disneyland, but it’s been retrofitted with a Nightmare Before Christmas theme; the attraction is open October to January. This is a very cool feature, and makes me want to go to Disneyland right now. You can watch this video with a pop-up trivia track, which I highly recommend; it’s informative, telling you about the retrofit and the classic Haunted Mansion. Off-Track (37:25) is an in-depth making-of documentary of the retrofit. They talk about every last nook and cranny of the ride, and it’s very cool to see. The best feature on the entire disc is Tim Burton’s Original Poem Narrated by Christopher Lee (11:37). The film was inspired by a poem Burton wrote years earlier, and until now, it hasn’t been released to the public. Christopher Lee gives a great reading of this excellent poem, and it’s all set to animation inspired by Burton’s concept art. This is a must-watch, and if this was the only feature on the disc, I’d be satisfied. Next is the Audio Commentary by Tim Burton, Director Henry Selick, and Musician Danny Elfman. They were all recorded separately, so there’s no banter back-and-forth, but it’s edited in a way that works very well. It’s a great, must-listen commentary. Sadly, the commentary by by Selick and Director of Photography Pete Kozachik from the old DVD is absent on this release. Those who enjoyed the commentary might want to keep their old DVD. Despite this, the new commentary is excellent. Also presented here are Frankenweenie (30:05) and Vincent (5:55), two great short films that Tim Burton directed in the eighties. Frankenweenie is a humorous live-action spin of the Frankenstein myth, and includes a new introduction by Tim Burton where he announces that a feature-length, stop-motion version is in the works. I can’t wait. Vincent is a stop-motion tale about a boy who wants to be just like Vincent Price; narrated by Price himself, this a terrific short. There are 3 Deleted Storyboards (2:53) that are interesting to watch, but not essential. The 4 Deleted Animated Sequences (5:06) are better; stop-motion films don’t usually have deleted content, and while all of this belongs on the cutting-room floor, it’s cool to see fully animated scenes that were cut. One of the best features on the disc is The Making of Tim Burton’s The Nightmare Before Christmas (24:44). It’s not a very long documentary, but it tells you nearly everything you’d want to know about the movie. The next feature is The Worlds of The Nightmare Before Christmas, and there’s honestly too much here for me to list. It’s split into three worlds—Halloween Town, Christmas Town and The Real World. Each section contains tons of concept art, as well as animation tests with commentary by Selick. Storyboard To Film Comparison (3:47) is a montage of scenes and their storyboard counterparts; if you like storyboards, then you’ll love this. The final section is Posters and Trailers, which contains a poster gallery, the excellent Teaser Trailer (1:43) and the uninspired Theatrical Trailer (1:26). A second disc is included with the Blu-Ray release which contains a Digital Copy of the film that you can put on your computer to watch or transfer to iPod. I hate it when Digital Copies are released on DVD, because they’re useless, but on a Blu-Ray release, it’s appreciated. If I want to watch the film somewhere other than on my hi-def TV, I have this digital copy. It adds to the value of the purchase, without driving the price up. The addition of the digital copy pushes the extras into perfection territory. Every single feature from the prior DVD release is here, save for the old commentary. If you don’t care about the commentary, then you can happily sell your old DVD to get this Blu-Ray edition. The features are extensive and cover every aspect of the production, but there are also plenty of features separate from the film, like the two Burton short films. Altogether, you get over 2 hours of video material, plus tons of art galleries. The extras round out an altogether perfect package. As far as presentation goes, load times on the disc are fairly quick, and the menus are cool and easy to navigate; my only complaint is that the disc opens with 9 previews that you must skip through; you can’t just hit the menu button. This doesn’t take long, but it’s something Disney has to fix for future Blu-Ray releases. One of my favorite films has arrived in a Blu-Ray package that is a definite home-run. The image will blow your mind, and the extras are exhaustive. The disc comes with a seemingly hefty price tag of $35 bucks (at most stores), but the package is so good that it soon becomes clear that the purchase is worth every penny. If you don’t own a Blu-Ray player, this edition is also available on standard-def DVD. Whatever way you buy it, you will be amazed.